​Students should anticipate spending additional time outside of classroom sessions to complete the work assigned. Studio is open lunch and after school daily (unless otherwise posted). ​ If you miss a lesson or sketchbook assignment, please visit your teacher's website. 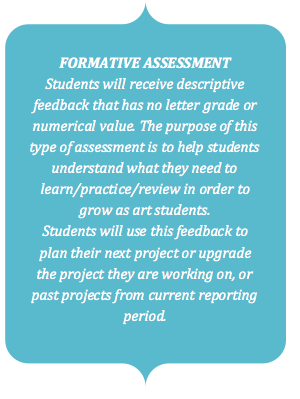 Assessment tools: self-evaluation of major projects, daily checks, sketchbook assignments and critiques. A final mark will be generated after the student/teacher final portfolio interview. ABSOLUTLY NO CELL PHONES OR PERSONAL MUSIC DEVICES in the classroom unless with teacher permission. If such devices (including EAR PHONES) are displayed, students will be asked to keep cellphones in bag or faced down on tables. Only reason to be using technology in the classroom is for research and FreshGrade.